Mike Harris is publisher and editor of The Cyprus Branches Trilogy, and grandson of its author, William E. Thomas. Today I’m hosting a guest post as part of the It Never Was You blog tour. You can read my review from yesterday here and enter to win a copy here. 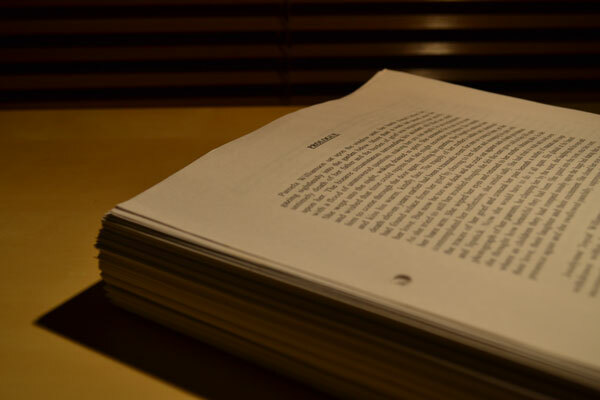 A PEEK AT THE PROCESS – HOW DO YOU GO ABOUT TURNING AN EPIC NOVEL INTO AN EPIC TRILOGY? To bring the blog tour to an end, I thought it would be appropriate to go back to the beginning, in a sense. Most authors, when they head off on a blog tour, will put together various blog posts revealing interesting facts and anecdotes about their own writing process – how they conjure up their storylines, how they develop and play with their characters, where they write, how many times they’ll draft a chapter before they’re happy with it, that kind of thing. Readers love to find out more about the authors behind their favourite books, and these posts go a long way to gaining a greater understanding of the people behind the prose. Unfortunately, those kinds of posts just weren’t an option for this tour. I’ve done my best to give readers an insight into what kind of man William is, and reveal how he created the Cypress Branches, but there’s only so much I can reveal about his process. What I can do, though, is reveal what went on behind the scenes in my process, turning his manuscript into the Cypress Branches trilogy. I thought readers might like to know just how the trilogy came about, and how the many challenges that the project presented were overcome. So how do you go about transforming one epic manuscript into three perfectly formed novels…without the aid of the author? 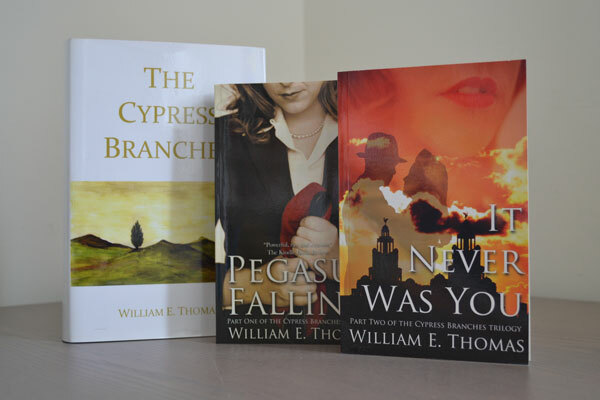 As many of you will know, William wrote the Cypress Branches as one large 350,000 word work. By any account, it was huge. Not quite on the scale of War And Peace, but a good chunk of it. You may be thinking that’s quite a daunting task tackling a manuscript that mighty, and you’d be right. Where on earth do you begin?! William wrote his book in an episodic form, with the action bouncing from one storyline to another with each chapter, and more than one cliff-hanger to keep readers on their toes. The original book was split into six volumes, which he called “books”, with a prologue and epilogue tying things up nicely at each end. 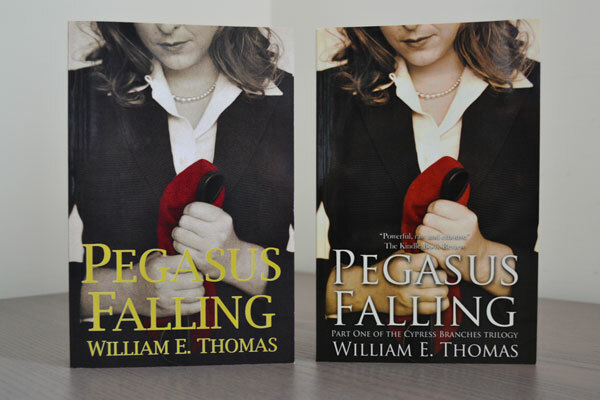 As there were six volumes, and I planned on creating a trilogy, the easy option would be to put “books” 1 and 2 in Pegasus Falling, 3 and 4 in It Never Was You, and so on. Unfortunately, that just wouldn’t work in this case. I felt it was absolutely crucial that the individual books would hang together properly and stand alone as novels in their own right – that there is a proper beginning, middle and end to each instalment. The chapters in “Book 1” follow three distinct storylines. One features the merchant seaman Harry Williamson, another features the young Mary Sullivan, and another follows the story of Parachute Regiment Captain Sammy Parker. In “Book 2”, however, Harry and Mary’s stories are almost completely forgotten, and we follow Sammy’s story exclusively to its dramatic conclusion. If I had bound “Book 1” and “Book 2” up as they were into one volume, we would be left hanging with Harry’s and Mary’s storylines. I could see readers feeling confused and a little cheated if they got to the end and didn’t know what had happened to these characters – and what on earth it had to do with the rest of the action. But thankfully, William’s style meant that the invididual storylines were written in their own chapters and those which featured Harry and Mary could be completely excised from part 1 of the trilogy, so that we concentrate wholely on Sammy’s story. So, what you’re actually reading in Pegasus Falling is half of “Book 1” and all but one chapter of “Book 2”! It Never Was You picks up the threads of “Book 1”, that missing chapter from “Book 2” and all of “Book 3”. (It would be interesting if readers can spot which chapter was taken from “Book 2” – there is a very good reason for moving it!) Part Three of the trilogy will contain all of Books 4, 5 and 6. It will be a larger volume than the previous two (around 150,000 words), but will work brilliantly as a novel in its own right. Once I had worked out what each book in the trilogy would contain, and which storylines would go where, the rest of the structure slotted into place fairly easily. But there were still challenges ahead. In order to make the books flow, it was necessary to make a number of minor changes. Ordinarily, the editor would sit down and discuss these kinds of changes with the author, making sure both parties were in agreement with how to proceed. But with William in the advanced stages of Alzheimers’, this simply wasn’t an option for me. It has been said that for an author, cutting words, paragraphs and passages from your precious book is tantamount to killing a loved one. All those hours of labouring over a hot keyboard wasted in the blink of an eye and a simple “CTRL-X”. But sometimes it’s a necessary evil act carried out for the good of the book. As I pored over the manuscript, it was obvious to me that with the new structure, cuts and changes would have to be made, and it would ultimately be my decision, as the author was powerless to help (or stop!) me. Needless to say, I didn’t take that responsibility lightly at all. With the chapters that would become Pegasus Falling in front of me, I pondered how on earth I would make the beginning of the novel work. What became Chapter One was originally Chapter Six of The Cypress Branches. It had not been written with the intention of opening a book. Consequently, it didn’t have the punch needed to hook the reader straight away. My solution was to cut two scenes – nearly 2,000 words – so that instead of the very first lines of the trilogy being a well-meaning but rather pedestrian scene in an Army Ops Room, we’re thrust straight into the action with Jan Doorn cycling home to break the news to his wife that paratroopers are dropping from the skies in their thousands. You can read the deleted scenes in this blog post. I think you’ll agree that, although there is nothing wrong with the scenes in principle, they don’t work as the opening of a book. Although from an editorial point of view this decision made perfect sense, emotionally it was a difficult choice to make. After all, these were not my words I was deleting. Luckily, there weren’t many occasions when I had to make such a decision. But each time I have had to, I have asked myself whether William would have agreed to the changes or not. If I couldn’t convince myself that William would have been happy with what I’d done, I would try and find another solution. I’ve managed this by thinking back to conversations in the past involving the books – I do miss talking to him about his characters and stories – and discuss the problem with other members of the family who have read them. My nan, William’s wife Sheila, was a constant source of inspiration and support, and she often kept me on the straight and narrow throughout the process. She was the first to read William’s manuscript – he would read her each day’s efforts every evening, and she would talk him through any concerns she had and tell him what was working and what was not. 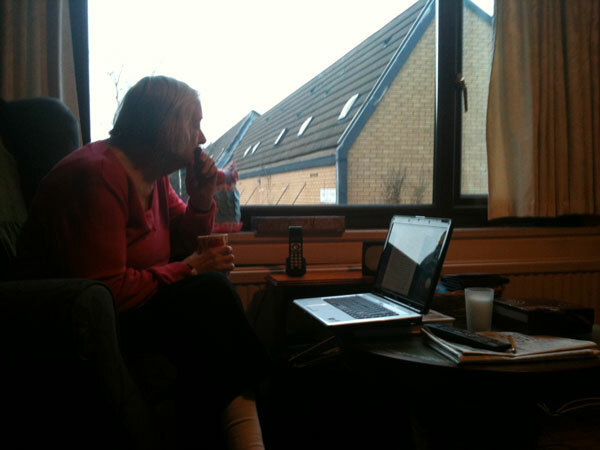 My mum, William’s eldest daughter Kim, also spent many hours talking to William as he went through his own exhaustive editing process. Both nan and mum became indispensible mentors to me throughout the process, offering their advice and opinions on countless edits. More often than not, they would give me their unreserved blessing to make a change, telling me that it sounded like “a marvellous idea”, but I knew full well that if either of them had doubts about something, they’d let me know. Alas, Sheila passed away earlier this year, so I’ll no longer be able to rely on her knowledge and support. Just one of the many ways she will be sorely missed. I came in to this entire project having very little insider knowledge of the publishing process. My day job was in television production and cameras and microphones are a very different world to ink and paper. So what on earth was I thinking taking on such a task? As soon as I dusted down the old manuscript and took a look at it, I knew that whatever course of action I took, I would make sure that I gave it the best shot of success. When, after careful consideration, I decided to take the self-publishing route, I was determined to create the best possible product I could. That meant tackling a very demanding learning curve. Before I took any action, I undertook extensive research into the book publishing process. I bought and read many books on the subject, scoured the internet for resources and guides, asked many questions and when they were answered, asked many more. Only when I had a good idea of what I was dealing with did I begin to think about tackling the huge manuscript. By far the biggest task I have undertaken is the copy-editing and proofreading. I knew that this was a task that was well within my capabilities, but I still didn’t want to take it on without the right grounding. So I enrolled on an editorial skills course which taught me not only the technicalities of editing and proofreading, but also the right attitude and awareness to have. Although I enrolled on the course specifically in order to work on The Cypress Branches, I didn’t realise just how handy the skills I learned would become in everyday life, and even in my day job! It is amazing just how often I’ve been called upon to use my training as a proof reader since completing the course. It’s a great life skill to have, and I can’t recommend doing a course enough! A beautifully edited and proofread manuscript is worth nothing, though, if it isn’t packaged the right way. Decisions need to be made on the style and formatting, so that each page looks and feels right. There’s the front matter to compile, the blurb and author biography to write, cover jackets to design, ISBN numbers to apply for (and turn into working barcodes), printers to find and negotiate with, ebook versions to create and legalities such as ensuring a copy is sent to the British Library. This is just a handful of the many tasks that have to be tackled, and I wasn’t prepared to continue with the project unless I knew that I could create a product worthy of the efforts William had put into writing the book in the first place. Of course, you can’t get it right first time every time, and I have learned a lot of valuable lessons over the course of the last five years. which would catch your eye on the bookshop shelf? I’m the first to admit that the cover for Pegasus Falling wasn’t executed brilliantly to start with. Even after careful research, there’s always something that you didn’t think of which comes back to haunt you. After all, graphic designers don’t learn their trade over night, and there is an art to designing a successful book cover. Even though all it has taken is a few tweaks, it’s now a much more successful cover. I learned a lot of lessons whilst working on it, and those lessons were ploughed in to the cover of It Never Was You, which I am very proud of. I think I got it right first time this time! Although I decided to create the covers of Pegasus Falling and It Never Was You myself, I did hire in professional help along the way – I had a photographer and stylist as well as actors involved in both photo shoots, which proves the point that a project like this can’t be tackled without any outside help – and it’s always a good idea to get others to help fill in the gaps where your own skills aren’t quite up to the mark. I only have one regret from this whole process, and that is I didn’t get the ball rolling sooner and have the opportunity to do this with William alongside me. I would have loved to have put these books together with him, and can only imagine the conversations, arguments, triumphs, tragedies and not to mention laughs that we would have had along the way. I often wonder whether the books would have come out differently had William been involved in the publishing process. Would the titles have been different? Would he have settled on the structure that we have now? Would he have taken the drastic step of re-writing vast swathes of the manuscript, given the chance? Alas, we’ll never know. But what I do know is that I’m incredibly proud of what my grandfather achieved by writing The Cypress Branches, and I won’t be happy until all three parts of the trilogy are out there on the shelves so that they can be read by their rightful audience.